It can feel like you’re navigating a maze blindfolded while carrying a 100-pound backpack and getting hit with paintball pellets (Ouch!). I'm talking about classroom management - one the most challenging aspects of teaching today. I don’t know about you, but I don’t think my teaching program did a fair job of letting me know what I would be facing as a teacher. Textbooks and teacher preparation classes painted a picture of compliant, well-behaved students who couldn’t wait to learn. This may have been the experience of teachers 75 years ago, but it sure hasn’t been my experience or the experience of ANY teacher I know that is currently in the classroom. I think it is time we be honest. Now I am not saying you can't get your students to that place, but in my experience, a peaceful, focused on-task, classroom, filled with quality learning requires hard work and EXCELLENT classroom management that is applied with godly wisdom. Sadly, teachers don’t always have the trust and respect of those they serve, and as the morals and values of a society implode, public servants like teachers are often left to clean up the mess. It is not your imagination. A huge number of young people are more disrespectful and rebellious than ever before. Parents often want to excuse their kid's wrong-doing and blame you! Administrators are often pressured to avoid disciplining students, so they might place those pressures on you. The workload is heavier than ever. You're not alone in these observations. I have taught in a charter school, a private Christian school and a public school. I have taught primary and secondary school. I have taught students of millionaires and students that did not know if they would have dinner each night. The classroom management challenges have been very similar in each situation. If you are in the classroom now, you have a reason to believe that God has called you to be a teacher for such a time as this. Students need godly teachers more than ever (in Christian schools and public schools), and He has called YOU! You can be a better classroom manager. You can build more trust with students, parents, and administrators. You can touch and even transform lives. However, there are some pesky roadblocks you may encounter, and it takes wisdom to avoid crashing into them! The roadblocks are often both internal and external depending on your circumstances and environment, but being prepared for them will help your year run smoother and save you lots of time, energy and potential conflicts down the road. 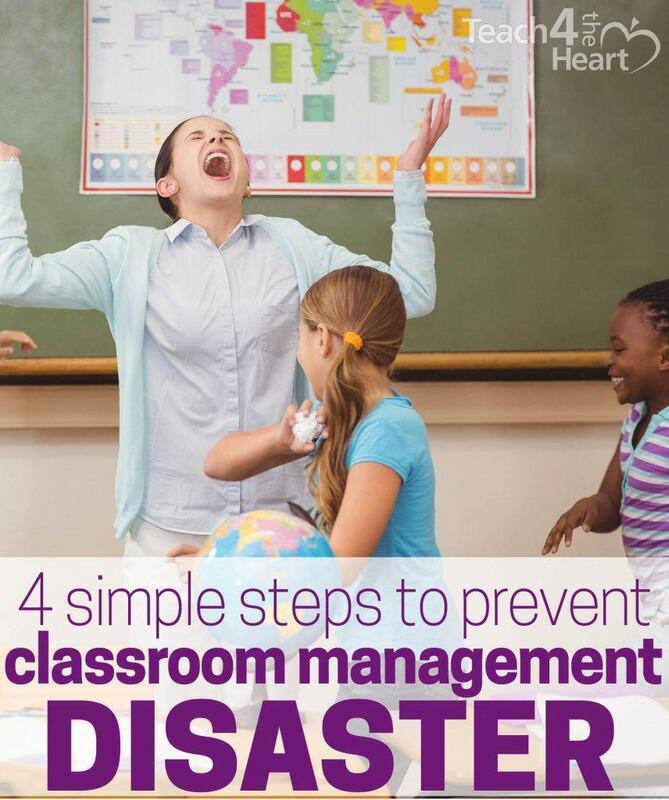 Here are 4 simple steps I learned the hard way that will help you avoid classroom management disaster! 1. Don’t let students manipulate you with their emotions. Have you had a student start bawling when you gave them a detention? Have you experienced a student’s explosive anger when they don’t get to go to recess? Ever have a student protest vehemently that they should have been the student of the week and that you always pick the same kids for everything—hurtfully accusing you of showing favoritism? When you give consequences or withhold rewards as a part of your classroom management plan, you will likely encounter pushback intended to cause you to feel guilty, second guess yourself or give in to the student’s demands. And this problem can be compounded when students band together against you. Second guessing and giving in to demands are big mistakes, though, because students will realize they can turn on the waterworks, throw tantrums, or rope you into an emotional debate and control you through the sheer force of their feelings. Many times the student’s emotions are genuine, but often times students will play up their emotions to see what you will do. The trick is to remain calm and stick to your consequences and rewards. Once your students see that you will remain calm, resolute, and unshaken in the midst of the storm of their emotions, students will typically try those tactics less and less. Use prayerful discernment to decide whether or not to console students in the moment or acknowledge their wounded feelings, but don’t by any means let their hurt or upset feelings change your pre-determined set of consequences or rewards. Of course, there are rare circumstances where you truly feel led to cut the student a break or give them another chance, BUT this should be a rare exception. Otherwise, students will be confused and not know what to expect from you. The goal is not to become an unfeeling automaton but rather a consistent leader that does the right thing for students even when it is unpopular. Students ultimately respect someone they know they cannot manipulate. 2. Document everything you can, and let the world know you are keeping track of everything! A wise veteran teacher once told me to document everything, and this little gem of wisdom has proven true every time. Sadly, your word alone as a teacher is often not enough. In our society, everybody wants proof, proof, proof! Oddly enough parents will often believe their kids over you (and kids lie….a lot)! Surprised? I was! It's a strange day we live in, so we must be prudent! When you call up little Johnny’s mom, it's better to say, “…this week I counted 37 blurts…” rather than “Johnny is being a little too chatty…”. It is more effective to let the parents know exactly how many assignments their child is missing instead of merely saying their child is not getting work in on time. Did a student say something (CRAZY?) —write it down word for word. Believe it or not, you will likely forget exactly what they said which leaves room for the student to deny it ever happened, and when you are in that parent-teacher conference, you are going to want to know exactly what was said and when. You can document in any way that is easy for your personality type, organization level, and style. Just have a system! It can be as informal as a documentation notebook you carry around everywhere to jot notes down. It can be as fancy as an excel spreadsheet with student names and different columns representing various behaviors and the number of times they occur. I personally like carrying around a red clipboard with student names and boxes to give "checks" for the most common misbehaviors like talking without permission. When the students see me pick up the clipboard they know I am tracking and documenting their behavior, and it calms them down. There are also amazing online programs and apps like Class Dojo that make tracking these things a cinch. Time is in high demand for teachers, and it can feel too tedious to document, but this is one investment that pays dividends. And the beauty is — students will behave better when they know you are tracking their behavior and documenting what happens day to day. There is instant accountability, and when you follow through with consequences, students will think more closely about their actions! 3. Keep your expectations high, and don’t apologize for it! As a teacher, there are so many pressures that might tempt you to lower the bar, but don’t do it! Students may complain when you have high standards and parents may even complain, but true leadership involves holding on to godly principles that remain strong, time-tested and true in the face of adversity! As society drifts farther and farther from God, the world’s standards and expectations sink lower and lower. This naturally makes Christians seem all the more peculiar, which is a good thing, but also a challenge at the same time. You see, the most basic Christian standards look like high expectations to the world, and truly high expectations look impossible to the world. Don't feel bad about expecting students to talk to you respectfully. Don't feel old fashioned when you stop students from using inappropriate language or off-colored jokes! Teach students the importance of honesty, hard work, and integrity! Encourage modesty and enforce your school's dress code. You may be the only teacher that you know who's calling kids up higher, but you will be a massive blessing in a child's life, even if they are not yet a Christian. Even if they never become a Christian, you will have served them by speaking Biblical truth into their heart and mind. This same principle remains true if you teach Christian students. Many Christian students are so inundated and brainwashed by the world, that Biblical truth sounds foreign. Christian students need strong, fearless teachers that won’t bend the truth of God’s Word. Speaking the truth and upholding truth might put you on a path of conflict, but don't shy away. Truth is desperately needed in Christian and secular environments, and God has placed you at your school to be a beacon of light and a proclaimer of truth! Last but definitely not least, pray! I have seen God do amazing things through prayer, but sometimes when we are the most stressed prayer seems like the last thing our flesh wants to do! In Matthew 26:41 Jesus says, “Watch and pray so that you will not fall into temptation. The spirit is willing, but the flesh is weak." One teacher’s temptations will be different than another's. You may be tempted to avoid disciplining certain students out of fear of their reaction or even their parent’s reaction, while another teacher may struggle with taking vengeance on a certain student due to their behavior. On some days you may be tempted to yell and scream at your students while other days you may be tempted to simply disengage, hand out a worksheet and sit at your desk browsing your favorite online magazine with a mocha. Often we are tempted to simply give up and coast until the end of the school year, but with the Lord's help, we can overcome all of these negative emotions. I would recommend two types of prayer. First, I believe it is important to have a daily prayer time where you pray over a list of things that are going on in your life and the lives of those you care about. You simply talk to God all day. Ask Him to help your observation go well. Ask the Lord to help you be patient today. Ask Him for more energy and focus. He wants you to pray and walk with Him throughout your days. Ask Him to make you a better classroom manager and ask Him for courage! God is more than willing to help you with any and everything you struggle with, and there is nothing too big or too small for him. If your journey is anything like mine, God will often use teaching as the fiery furnace to burn off things that are displeasing to Him, so don't be surprised when yucky stuff rises to the surface. Finally, don’t be discouraged by slow progress in your classroom management, and try not to make comparisons between yourself and others. Look for help wherever you can find it; then pray and ask God to help you implement what you learn. You may not always feel like you are making a difference, but God is using you in the classroom even in spite of your weakness. Want help putting it all together? 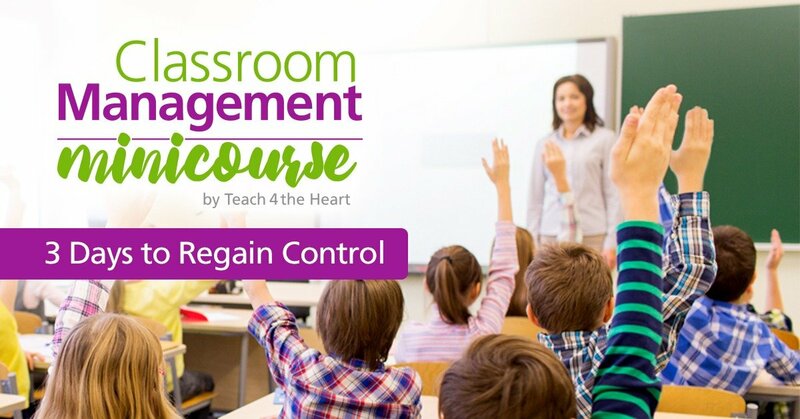 Grab our free classroom management minicourse that will help you regain control in just three days. Trish Lott is a passionate educator in her 6th year of teaching. She has experience working in public, private and charter schools in both urban and suburban communities, and she has taught at the primary and secondary level. Trish has a passion for teaching students to love reading and history while helping them grow in character. She lives in the Midwest with her husband. Her hobbies include reading, exercising, singing and writing. This was an EXCELLENT article. As a student teacher and later as a new teacher with my first year under my belt , I slowly found out from experience and from asking veteran teachers (rather desperately questioning them, at times) that, no, as you say, it was not my “imagination” that student behavior, and in some cases, parent and administration behavior, went against basic expectations. When I tried to explain to friends and family, they couldn’t understand until I acquired enough anecdotes to paint a vivid picture, and even then they often remained in near-disbelief. But I love how this article focuses on the right mindset as well as proven practical solutions rather than complaining about the state of things! Your points at the very end especially impacted me: remembering that God is always there to help, that often character defects often surface in our “trial by fire” as developing teachers (which surprise threatened to hugely discourage me at first), and that we shouldn’t compare our classroom-management progress to others (In my first year I replaced another teacher long-term and initially kept hearing about how effective she had been–not very heartening for a new teacher with tons of new challenges). I kept praying and learning from sites like this one, and received some major compliments from students and colleagues at the end of the year (including some huge behavior turnarounds) , but getting there was a REALLY tough journey at times. I wish I had been able to read this article back when I was a student teacher in order to be better prepared for what to expect, and thus less caught off-guard. Thank you so much for sharing your wisdom!